Personalized Pet Necklace is the perfect gift for the dog lover in your life, we are! and also makes a meaningful gift for pet memorial. 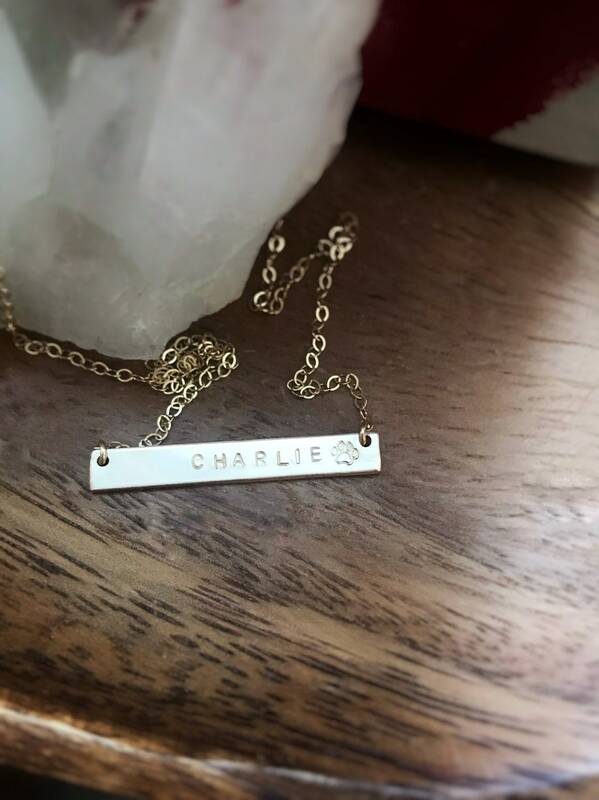 This delicate necklace hand stamped with your dogs name on the bar with a perfect paw print, it’s so cute. Will fit 8 characters most comfortably with the paw stamp. great for everyday wear, will match to all your gold earrings. Photo shows the Bar Necklace 14k gold filled in 18 inches. 1. What you would like written on the bar. HAND STAMPED JEWELRY - This jewelry is all handmade. Every piece is very carefully crafted. No one piece is exactly the same of the picture. That is what gives it such beauty and character. Please note that the photo is a representation of what you will receive.